The train journey from Nuwara Eliya is one of the most scenic in the world and must be one of the cheapest too if you go in third class. Train is heading towards Badulla. 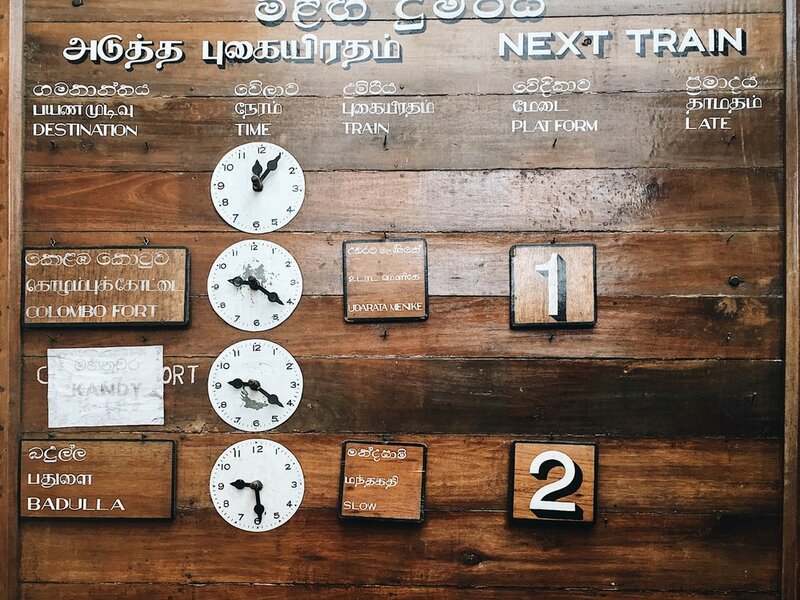 There is an express train too which is quicker if your in a rush but take your time and get the slow train if you can as this journey is an amazing experience. You'll need to get a taxi or tuk tuk from Nuwara Eliya to the local station Nanuoya it's about ten minutes ride. We paid 800 Rps for this, but it maybe worth a haggle if you can be bothered. You can reserve first class tickets or buy on the day, but it's often booked up, though maybe not so much in the low season. We'd read other bloggers had used third class and loved it so we gave it a go and the ticket only cost us R60 / 30p. As mentioned it cost R800 / £4 to get a tuk tuk to the station from Nuwara Eliya so the fare is a bargain. It can get really chaotic getting onto the trains as normally gentile SriLankan folk fight it out to get a seat. Luckily we'd picked a quiet day and were straight on with window seats. What we did not realise was the best seats for the views are on the left hand side of the train in the direction of travel. You'll still get good views on the right but bag the left side if you can. Various men with tempting tasty snacks jump on and off the trains between stations offering various quick eats from deep fried Dahl to strawberries and even rail side ice creams passed through the windows. All at only R50 we actually spent more on the snacks than the train fare. The train doorways are always popular for hanging out or sitting in. Most of the train windows are open anyway so plenty of air con in all classes so not much need for 1st or 2nd class. Trains can stop from a few minutes to 20 at some stations so plenty opportunity to stretch legs rail side, or jump off train and across the tracks to the loo. We smiled and engaged with a few words to one SriLankan family who loved the chocolate we had but less impressed with strawberries. They let us sit with them and offered their seats so we could take photos at a particularly stunning section of the journey. If your in SriLanka this journey across the mountains and tea plantations is a must and the best 30p you'll ever spend. There is also the another great journey from Ella to Kandy which we've not done yet.